The Thomian run of success in this year’s tournaments was brought to an unexpected end when the Josephians came up with an stunning performance to defeat them by 53 runs on first innings at the Royal College grounds. Josephians all-rounder Dunith Wellalage produced a brilliant performance with bat and ball to crush Thomians hopes. To begin with he mesmerized the Thomian middle order on his way to bagging 5 for 45 in 15 overs. He had not done, as coming to the crease with the total on 60 for 4, pursuing a target of 217, Wellalage got stuck in and took the score to 243 before he was dismissed. His knock was not all defense. In fact his 88 runs consumed only 104 balls with the runs coming almost at break-neck speed. Wellalage’s partnerships of 70 for the fifth wicket with Dineth Jayakody, and another of 62 for the sixth with Sachintha Ravindu were the efforts that broke the camel’s back. Thomian’s speedster Kalana Perera succeeded in snatching three wickets but at great cost. His economy rate was 4.85. From that point of view Shannon Fernando’s 2 for 49 in 18 overs was the pick. 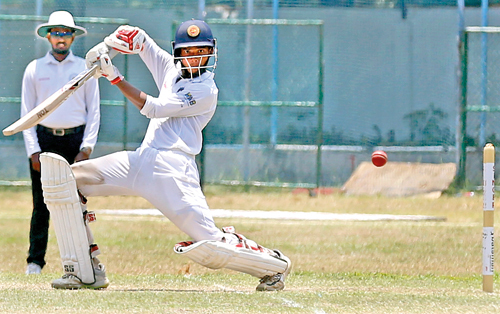 The Thomian had been playing at a high level for sometime and a reversal of fortune was due. Save for skipper Sithara Hapuhinna who made a splendid 117 off 127 balls with 21 fours and a six, the other batsmen notably Ryan Fernando, Ravindu de SIlva and Delon Peiris got starts but failed to go on.